If you're ready to build your very first Electron app, here's a quick start guide to help you get started. We are excited to see what you build next with Electron. We released Electron when we launched Atom a little over two years ago. Electron, then known as Atom Shell, was the framework we'd built Atom on top of. In those days, Atom was the driving force behind the features and functionalities that Electron provided as we pushed to get the initial Atom release out. Now driving Electron is a growing community of developers and companies building everything from email, chat, and Git apps to SQL analytics tools, torrent clients, and robots. In these last two years we've seen both companies and open source projects choose Electron as the foundation for their apps. 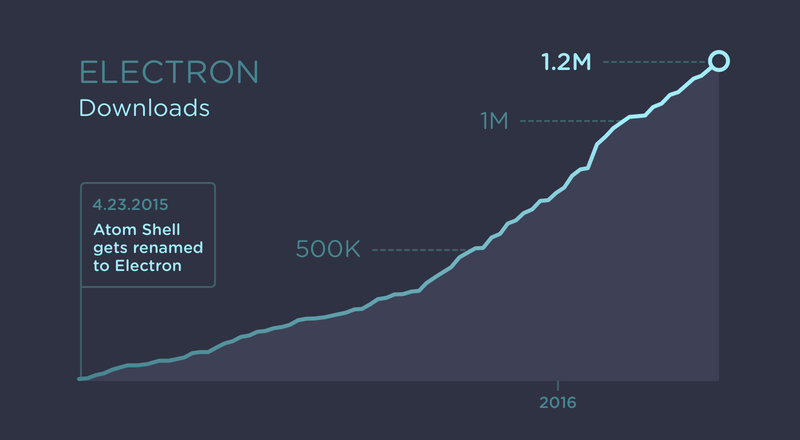 Just in the past year, Electron has been downloaded over 1.2 million times. Take a tour of some of the amazing Electron apps and add your own if it isn't already there. Along with the 1.0 release, we're releasing a new app to help you explore the Electron APIs and learn more about how to make your Electron app feel native. The Electron API Demos app contains code snippets to help you get your app started and tips on effectively using the Electron APIs. We've also added a new extension to help you debug your Electron apps. Devtron is an open-source extension to the Chrome Developer Tools designed to help you inspect, debug, and troubleshoot your Electron app. Finally, we're releasing a new version of Spectron, the integration testing framework for Electron apps. Electron 1.0 is the result of a community effort by hundreds of developers. Outside of the core framework, there have been hundreds of libraries and tools released to make building, packaging, and deploying Electron apps easier. There is now a new community page that lists many of the awesome Electron tools, apps, libraries, and frameworks being developed. You can also check out the Electron and Electron Userland organizations to see some of these fantastic projects.